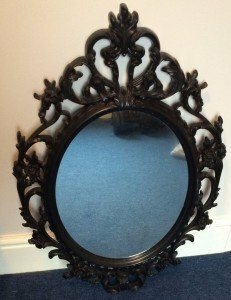 A large vintage ornate oval black forest wall mirror, heavily carved all around. 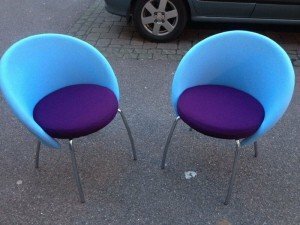 A pair of purple and bright blue rounded back office chairs on chrome legs. 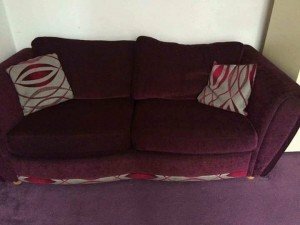 A two seater high back sofa on wooden ball feet, upholstered in wine red velour and patterned velour. 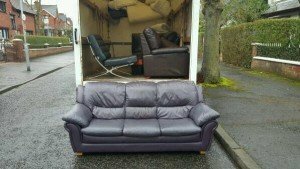 A three seater high back sofa on wooden square feet, upholstered in deep purple leather. 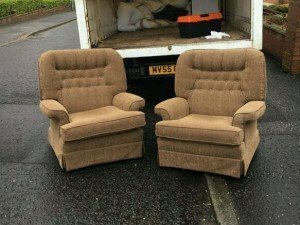 A pair of vintage high back gentleman’s armchairs, upholstered in camel fabric with button back detailing. 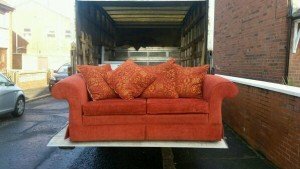 A two seater low back sofa upholstered in burnt orange velour, together with four large patterned sofa cushions. 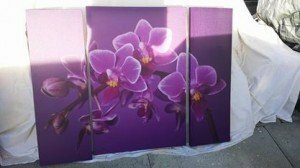 A large three piece wall canvas depicting a group of three flowers against a purple ground. 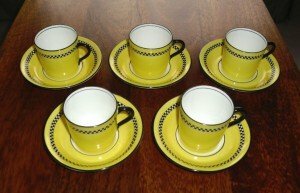 A set of five porcelain yellow and checkered pattern coffee mugs, together with five matching bowls. 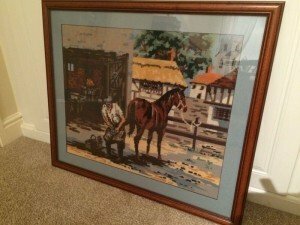 A large vintage tapestry depicting a man and horse in the stables, mounted in a solid wood frame. 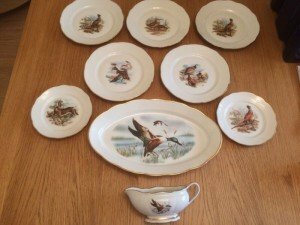 A vintage porcelain dinner set decorated with a game birds, includes a platter dish, a gravy bowl, dinner plates and side plates. 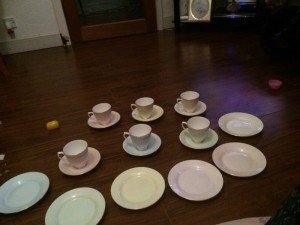 A vintage colourful tea set, includes six teacups, six saucers and six side plates, decorated with a gold rim. 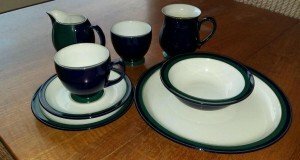 A collection of Denby Regatta dinnerware, includes two jugs, a teacups, a saucers, a side plate, a bowl and a dinner plate. 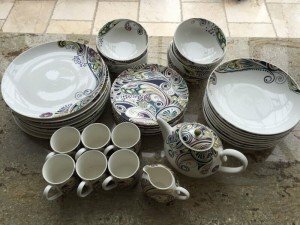 A Denby pottery 44 piece dining set decorated with the Monsoon cosmic pattern. 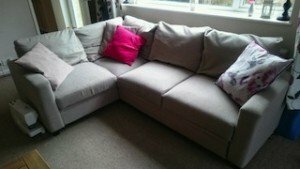 A four seater low back corner sofa on wooden feet, upholstered in stone cotton fabric. 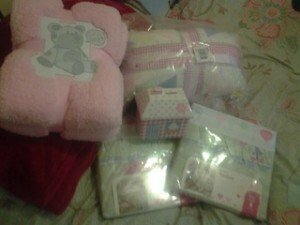 A collection of home accessories, to include a pink teddy bear plush blanket, a shabby chic cushion, two bed sets and a house shaped money box. 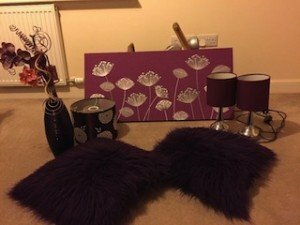 A collection of purple home accessories, to include a large wall canvas, two faux fur cushions, a lampshade, a pair of table lamps and a vase. 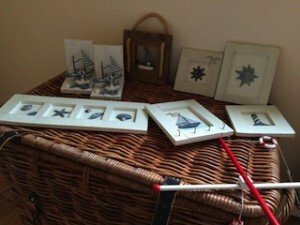 A collection of nautical themed home accessories, to include seven various wall pictures and bookends. 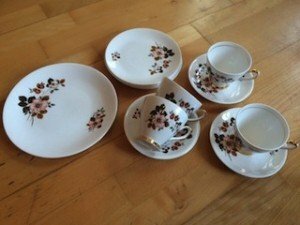 A vintage floral patterned and gold rimmed part dinner service, includes dinner plates, teacups, saucers and a platter. 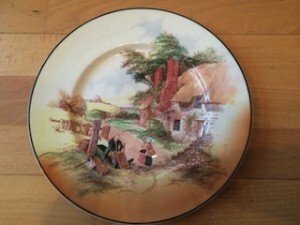 A vintage Royal Doulton cabinet plate, decorated with a family in a cottage house scenery. 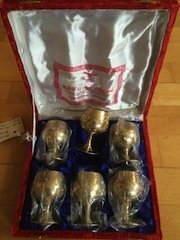 A brand new set of six Arabian brass drinking cups, in a red velvet presentation box.